Bruce H. Lipton; Santa Rosa, CA, Mountain of Love/Elite Books, 2005; 224 pages. The ‘central dogma’ of modern orthodox biology is that life is controlled by genes. In The Biology of Belief, cell biologist Bruce Lipton explains how the latest research has shown genetic determinism to be fundamentally flawed, and presents a very readable account of the ‘new biology’. He says that research into the way cells receive and process information shows that a cell’s life is controlled not by its genes but by the physical and energetic environment, which, in the case of humans, includes our thoughts. He writes: ‘The belief that we are frail biochemical machines controlled by genes is giving way to an understanding that we are powerful creators of our lives and the world in which we live’ (p. 17). The ‘new’ biology is an advance on the old one but, as we will see, it still has severe limitations. Since the cracking of the genetic code by James Watson and Francis Crick in 1953, DNA has assumed an all-powerful status. At first it was thought to be responsible only for our physical characteristics, but then scientists started claiming that our genes control our emotions and behaviour as well. Lipton says that genes are simply molecular blueprints used in the construction of cells, tissues, and organs. But even this goes too far: genes are blueprints for the production of proteins – how proteins assemble themselves into cells, tissues, and organs is not understood. Prior to the Human Genome Project, scientists held that one gene was needed to provide the blueprint for each of the over 100,000 different proteins that make up our bodies. Since there are also over 20,000 regulatory genes, the human genome was expected to contain a minimum of 120,000 genes located in the 23 pairs of chromosomes. However, geneticists were shocked to discover that the human genome consists of only about 25,000 genes. More than 80% of the DNA that was thought to be required does not exist! The one-gene, one-protein concept, which was a fundamental tenet of genetic determinism, has therefore had to be consigned to the scrap heap. There is not much difference in the total number of genes found in humans and in primitive organisms. The microscopic nematode roundworm known as Caenorhabditis elegans has a body consisting of 969 cells and a simple brain of about 302 cells, yet its genome consists of as many as 24,000 genes. This means that the human body, comprising over 50 trillion cells, contains only 1000 more genes than this lowly worm. The fruit fly has 15,000 genes – 9000 fewer than the more primitive Caenorhabditis worm. Humans have roughly the same number of genes as mice! As geneticist and Nobel Prize winner David Baltimore has said, ‘it is clear that we do not gain our undoubted complexity over worms and plants by using more genes. Understanding what does give us our complexity ... remains a challenge for the future’ (p. 64). Lipton argues that genes cannot control life because they cannot turn themselves on or off. That is done by signals from the cellular environment. Epigenetics, the study of the molecular mechanisms by which the environment controls gene activity, is today one of the most active areas of scientific research. Environmental influences, including nutrition, stress, and emotions, can modify genes, without changing their basic blueprint, and these modifications can be passed on to future generations. DNA makes up only half the content of chromosomes; the other half consists of regulatory proteins, which are turning out to play as crucial a role in heredity as DNA. Studies of protein synthesis reveal that epigenetic factors can create 2000 or more variations of proteins from the same gene blueprint. Biologists’ central dogma (first formulated by Francis Crick) posits the ‘primacy of DNA’, involving a one-way flow of information from DNA to RNA to proteins. Lipton, on the other hand, argues for the ‘primacy of the environment’. Regulatory genes direct the activity of protein-encoding genes, but environmental signals control how regulatory proteins bind to DNA. The flow of information is therefore: environmental signal – regulatory protein – DNA – RNA – protein. Information can also flow in the reverse direction, but subject to tight restrictions: RNA can rewrite DNA, protein antibodies can change DNA, and changes in DNA influence the binding of regulatory proteins. Evidence for the role of epigenetic mechanisms has become so compelling that some scientists have started speaking favourably again of Jean-Baptiste de Lamarck (1744-1829), the much-scorned evolutionist who believed that traits acquired as result of environmental influence could sometimes be passed on to offspring. The genome is certainly turning out to be far more fluid and responsive to the environment than previously supposed. It is clear that DNA does not control biology, and that information can be transmitted to descendants in ways other than through the base sequence of DNA. Whereas traditional darwinism sees evolution as essentially random, purposeless, and violently competitive, Lamarck suggested that evolution was based on cooperative interaction among organisms and their environment. In Darwin’s Blind Spot (2002), Frank Ryan chronicles a number of striking examples of cooperation among organisms. For instance, there is a yellow shrimp that gathers food while its partner gobi fish protects it from predators. There is also a species of hermit crab that carries a pink anemone on top of its shell. Fish and octopuses like to feed on hermit crabs, but when they approach this species, the anemone shoots out its brilliantly coloured tentacles, with their microscopic batteries of poisoned darts, and stings the potential predator. In return, the anemone eats the crab’s leftover food. We now know that genes are transferred between members of the same species and of different species. This highlights the dangers of genetic engineering. Tinkering with the genes of a tomato, for example, could alter the entire biosphere in unforeseen ways. One study has shown that when humans digest genetically modified foods, the artificially created genes transfer into and alter the beneficial bacteria in the intestine. Similarly, gene transfer among genetically engineered agricultural crops and surrounding native species has given rise to highly resistant superweeds. As Lipton says, scientists are messing around with our genes and environment without understanding how interconnected everything is. Although cells appear to be anatomically simple, they display incredible complexity and power, and employ technologies that scientists have barely begun to understand. Like humans, single cells analyze thousands of stimuli from the microenvironment they inhabit, and select appropriate behavioural responses to ensure their survival. They are even capable of altering their own genes. Lipton proposes that the true brain controlling cellular life is the membrane – the ‘magical mem-brain’, as he calls it. The membrane is a semi-permeable, three-layered skin, only seven millionths of a millimetre thick, which holds the contents of a cell together. But behind its apparent simplicity lies great functional complexity. For instance, prokaryotes, which include bacteria and other microbes, consist of a cell membrane enveloping a droplet of cytoplasm, yet they display ‘intelligence’. They can sense the presence of food and propel themselves towards it, and they can recognize toxins and predators and take evasive action. Instead of the cell’s operations being controlled by DNA blueprints stored in the nucleus, as conventional biology would have us believe, Lipton proposes that this is done by integral membrane proteins (IMPs) – which include receptor (awareness) and effector (action) proteins. The membrane’s effector proteins, operating in response to molecular and radiant-energy signals which its receptors pick up from the environment, control the ‘reading’ of genes so that worn-out proteins can be replaced or new proteins created. The cell’s operations are therefore primarily moulded by its interaction with the environment, not by its genetic code. Genes cannot preprogram a cell or an organism’s life, because cell survival depends on the ability to dynamically adjust to an ever-changing environment. In Lipton’s view, the membrane’s function of interacting ‘intelligently’ with the environment to produce behaviour makes it the true brain of the cell; if the membrane is destroyed, the cell dies. In multicellular organisms key functions of the membrane are taken over by specialized tissues and organs – nervous system, lungs, muscles, etc. Millions of people attribute failing health not to a combination of mental, physical, and emotional causes, but simply to the inadequacies of their body’s biochemical mechanics. Increasingly, the first choice in dealing with unruly children, for example, is to medicate them to correct their ‘chemical imbalances’, rather than grappling with what is truly going on in their bodies and minds. Although scientists have linked lots of genes to lots of different diseases and traits, they have rarely found that one gene causes a particular disease or trait. Lipton points out that the diseases that are today’s scourges – diabetes, heart disease, and cancer – are not the result of a single gene, but of complex interactions among multiple genes and environmental factors. Only 5% of cancer and cardiovascular patients can attribute their disease to heredity. He argues that drugs and surgery are powerful tools when not overused, but the notion of simple drug fixes is fundamentally flawed. Every time a drug is introduced into the body to correct function A, it inevitably throws off function B, C, or D. That is why pharmaceutical drugs come with information sheets listing numerous side effects, ranging from irritating to deadly. People who take over-the-counter antihistamines, for example, may experience allergy relief but also the side effect of feeling drowsy. Synthetic hormone replacement therapy has been shown to have disturbing side effects that result in cardiovascular disease and neural dysfunctions such as strokes. According to a recent study, iatrogenic illness – illness resulting from medical treatment – is the leading cause of death in the US, and adverse reactions to prescription drugs are responsible for more than 300,000 deaths a year. Research suggests that our hyper-vigilant lifestyle has a severe impact on the health of our bodies. Almost every major illness is linked to chronic stress, and the inhibition of neuronal growth by stress hormones can lead to depression. Lipton argues that far more money should be spent on research into alternative medicine, such as acupuncture, chiropractic, homeopathy, and massage therapy, which are based on the belief that ‘energy fields’ help to control our physiology and health. The well-known placebo effect dramatically demonstrates the healing power of the mind: ‘fake’ drugs often prove just as effective as genuine chemical cocktails, provided patients believe they are receiving the ‘real thing’. The placebo effect has proved powerful in treating various diseases, including asthma and Parkinson’s disease. In a study of severely depressed patients, 50% of those taking drugs improved but so did 32% of those taking a placebo. In more than half the clinical trials for the six leading antidepressants, the drugs did not outperform placebo sugar pills. Interestingly, antidepressants have performed better and better in clinical trials over the years, suggesting that slick marketing has produced a placebo effect, demonstrating that beliefs are contagious! In a study of patients with severe knee pain, those who received surgery improved, but those in the placebo group (incisions were made in their knees and then sewed up) improved just as much. The opposite of the placebo effect is the nocebo effect. Negative thinking – including the hope-deflating messages that physicians sometimes convey to their patients – can damage health. For instance, a man suffering from cancer of the esophagus – a condition considered at the time to be 100% fatal – died a few weeks after his diagnosis, yet an autopsy found that there was not enough cancer in his body to kill him. Our positive and negative beliefs impact not only our health, but every aspect of our lives. In 1952 Dr Albert Mason, a British physician, used hypnosis to successfully treat a very severe case of warts, which covered most of a 15-year-old boy’s body. Mason was later shocked to learn that the boy was not in fact suffering from warts but from a lethal genetic disease called congenital ichthyosis. This shows that the mind can even override genetic programming. Mason tried to cure a number of other ichthyosis patients but never with the same success. He attributed this to his own irrepressible doubts about the ability of hypnosis to cure this genetic condition – in contrast to simple warts. According to the germ theory, bacteria and viruses are the cause of disease. This theory was developed in the 19th century and was initially very controversial. One critic was so convinced it was wrong that he brazenly gulped down a glass of water laced with vibrio cholerae, the bacteria thought to cause cholera. Astonishingly, the man’s belief was so strong that he was completely unaffected by the virulent pathogen! Another demonstration of mind over matter is fire walking: thousands of people have managed to walk across hot coals, while those who waver in their beliefs suffer burns. There are also many unexplained cases of terminal cancer patients recovering their lives through spontaneous remissions. He stresses that this requires not just positive thinking, but also eliminating the habitually negative and self-sabotaging thought patterns of the subconscious mind. The ‘new biology’ is still essentially a materialistic theory, which seeks to explain everything in terms of physical matter-energy. Although Lipton describes himself as having been transformed from an agnostic scientist into ‘a card-carrying mystic who believes that eternal life transcends the body’, his interpretation of ‘spirit’ and ‘immortality’ remains very limited. He does not say whether he accepts the reality of materializations and dematerializations of objects and entities, the projection and manifestation of ‘astral bodies’, and similar psychic phenomena that pose a far greater challenge to the materialistic paradigm. The main problem is that he equates ‘spirit’ and ‘mind’ with ‘energy’, but he seems to accept only conventional forms of energy, such as electromagnetic energy (e.g. radio waves, microwaves, visible light, and very low-frequency radiation) and acoustic energy. He claims that electromagnetic radiation is sufficient to explain not only protein folding and shape-shifting, and gene regulation, but also morphogenesis (the process by which cells form themselves into organs and tissues). More radical biologists such as Rupert Sheldrake, on the other hand, argue that previously unrecognized causal factors – like ‘morphic fields’ – are required to explain such phenomena. The same applies to instincts and the selfconscious mind. Lipton, however, speaks of instinctive behaviours being passed on to offspring ‘in the form of genetic-based instincts’ – yet there is no serious evidence that DNA encodes habits. He regards the mind as ‘immaterial energy’ seated in the prefrontal cortex of the brain, and does not appear to believe that it can exist independently of the body. He endorses the conventional darwinian view that the evolution of higher mammals somehow brought forth selfconsciousness, and declares that the ‘receptor-effector protein complex’ is ‘the fundamental unit of awareness/intelligence’, ignoring the possibility that mind works through physical forms and structures from more ethereal levels of reality. By contrast, according to the theosophic or ancient-wisdom tradition, consciousness is not magically generated by matter but is the ultimate ground of the universe; consciousness-life-substance is an eternal and universal unitary essence, manifesting in infinite degrees of density and in endlessly varied forms. The physical world is therefore the outer shell of inner worlds, composed of subtler grades of energy-substance (astral, mental, and spiritual), which are imperceptible to our normal senses but just as material to the entities that inhabit them as our own world is to us. Likewise, the physical body is animated and organized by inner ‘bodies’ – such as an astral model-body, a reincarnating soul or mind, and a spiritual-divine self or monad. Strong support for this worldview is provided by a broad body of scientific research in fields such as fundamental physics, ‘new energy’, psychic and consciousness-related phenomena, and memories of past lives. For adepts possessing the necessary occult powers, subtler realms and bodies are visible and tangible realities. 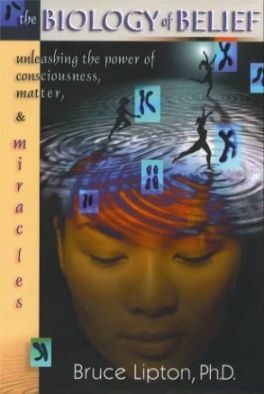 Lipton says: ‘We are immortal, spiritual beings who exist separately from our bodies’ (p. 184). Although this sounds very radical and progressive, what he has in mind turns out to be far more mundane than the existence of an immortal soul: ‘We are mortal and following our demise, ... our corporeal remains will be consumed and recycled back to the environment’ (p. 201). This is nothing but the common materialistic interpretation of ‘immortality’. Lipton does, however, go one step further, saying that just as a televison set picks up broadcasts transmitted through the air, so our self-identity is generated by information present in the external environment, which is downloaded by our cells’ receptors. He sees evidence that an individual’s ‘broadcast’, or ‘self’, is still present even after death in the fact that patients who have received organ transplants sometimes report behavioural and psychological changes. For instance, one conservative, health-conscious American was astonished when she developed a taste for beer, chicken nuggets, and motorcycles after her heart-lung transplant. Her donor turned out to be a young motorcycle enthusiast who loved chicken nuggets and beer. In another case, a young girl began having nightmares of murder after her heart transplant, and her dreams were so vivid they led to the capture of the murderer who killed her donor. But what is the nature of this ‘environmental information’? How does it originate and where is it stored? Lipton seems to be saying that it takes the form of electromagnetic radiation in our physical environment! He adds that each of us downloads only a narrow band of the spectrum, which in its totality constitutes ‘God’. According to theosophy, every physical object or entity, from atom to human to galaxy, has a more ethereal inner constitution in which memories can inhere. This means that if an organ is transplanted into another person, that person may under certain conditions tap into the memories associated with it. Lipton, however, rejects the notion of ‘cellular memory’, since he does not recognize the existence of astral bodies or of nonphysical forms of energy-substance of any kind. He postulates the existence of some sort of ‘environmental controller’ or ‘spirit’, from which we receive information and to which we relay our experiences, so that the way we live our lives influences our present character or that of someone in the future who picks up the same ‘information’. This interaction, he says, ‘corresponds to the concept of karma’ (p. 193)! Lipton’s narrow interpretation of reincarnation and karma is a very feeble and distorted echo of the teachings to be found in genuine mystical traditions, east and west. Instead of an ill-defined ‘spirit’, which somehow generates and maybe even consists of electromagnetic energy, and whose origin, locality, and end are left hanging in the air by Lipton, theosophy posits a series of inner bodies or souls of nonphysical grades of energy-substance, the lower ones eventually dissipating after death in the physical and astral realms, while our higher aspects endure for far longer. All our thoughts, deeds, and experiences are recorded in these various consciousness vehicles or souls, just as all events leave an imprint in the inner realms, and karma refers to nature’s fundamental tendency to restore equilibrium by following every action with an appropriate reaction, directed at whoever was responsible for the original action. In other words, we reap what we sow. Lipton’s truncated, earth-bound brand of mysticism rules out the progressive evolution of the same essential individuality from life to life. According to the wisdom tradition, on the other hand, reincarnating souls return to earth again and again, enabling us to learn from our mistakes and gradually unfold our higher potential. The new astral and physical bodies that the soul works through in each life contain many of the same atoms used in the past, which carry the record of its previous personalities. On every level of our being, we are exactly what we have made ourselves; what we inherit is our own past. That past is often something of a burden, but we always have sufficient free will to begin to change ourselves for the better. Physical heredity is not simply a question of genetic determinism, with our genetic makeup ultimately being a result of chance. Rather, it involves a soul being attracted to parents who can provide the physical body and environment best suited to its karmic needs. Moreover, physical DNA merely contains the code for the proteins that form the building blocks of our physical bodies. It does not govern the building of our bodies, nor does it determine our basic habits and character traits – these reflect processes taking place in our inner astral and mental bodies. Lipton’s attitude to evolution in general is similarly very limited. He argues that there is more cooperation in nature than traditional darwinism allows, that organisms respond ‘intelligently’ to their environment, and that the hereditary transmission of characteristics does not depend solely on DNA. But random mutations, environmental pressures, and epigenetic factors are not sufficient to explain the incredible diversity and complexity of earth’s lifeforms, or how new types of fully functional organisms tend to appear in the fossil record incredibly quickly. Nor do they explain the emergence of selfconsciousness. Again, the wisdom tradition offers a much broader vision, arguing that ‘memories’ of the patterns and prototypes from past evolutionary cycles guide and influence the present cycle, each physical lifeform being a vehicle for an evolving consciousness-centre or monad. To sum up: Lipton exposes many deficiencies in orthodox biology and evolutionary theory, and provides a good summary of cutting-edge biological research. We are, as he says, ‘spirits in material form’ and should live ‘in a way that supports everyone and everything on this planet’. However, although he believes the new biology ‘bridges science and spirit’, the ‘spiritual’ vision he offers is severely limited. He only accepts the existence of recognized forms of physical matter-energy, and ignores research pointing to the existence of more ethereal realms behind and within the physical world. by David Pratt. November 2005.